It follows the Ombudsman’s investigation of a complaint from a Metropolitan resident about cyclical maintenance not being carried out and how the landlord had handled that complaint. The Ombudsman found maladministration and made a number of orders to put things right including completing the cyclical maintenance works. Interim Housing Ombudsman Andrea Keenoy said: “It is important that residents have confidence in our service so, in those rare situations where a landlord does not comply with our orders, we must make sure they are held accountable for that non-compliance. Following a meeting with Metropolitan, I am pleased to report that they responded positively by providing confirmation that the works were underway and carrying out a wider review to learn from the outcomes. Information on the Ombudsman’s power to issue orders is set out in the Housing Ombudsman Scheme. This governs how the service works and the expectations on its member landlords. When the Housing Ombudsman makes an order, it will specify a time frame for compliance which is generally within three months. The landlord is asked to provide evidence to show that it has complied, unless it has already been provided by the resident. In 2017-18, 99% of orders were implemented within three months and 100% within six months. 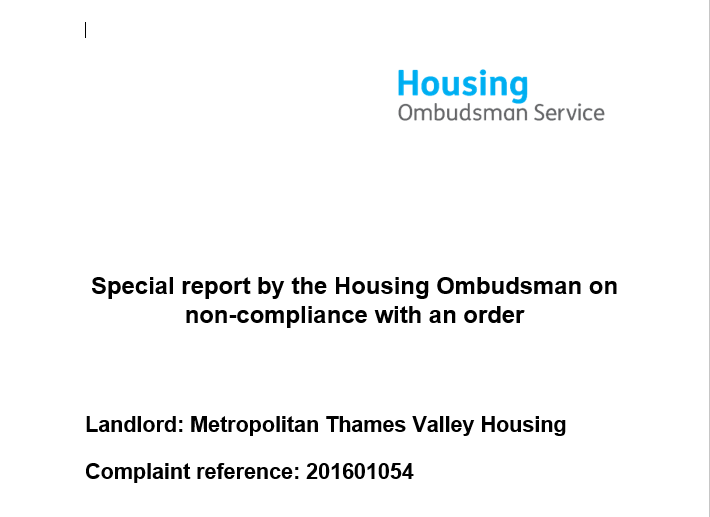 The Housing Ombudsman’s policy on dealing with non-compliance with its orders states that the Ombudsman will discuss the reasons for non-compliance with a landlord. The Ombudsman will then produce a special report setting out the reasons for non-compliance and the action being taken by the landlord. The report is sent to the landlord’s board or scrutiny body, published on the Ombudsman’s website and shared with the Regulator of Social Housing.